Formatting SQL or PLSQL Code for free online. When I started working on a requirement to customize a screen for an Oracle MSCA requirement the first thought that came to my mind was... What is Oracle MSCA ? How does this app work? How does it integrate with oracle application? What is the architecture?Most importantly where the hell is this documented? Which API's do I use? Where do I find setups? What is a barcode? Why is it so confusing? Oracle MSCA stands for moblile supply chain applications. It is based on MWA framework or Mobile Wireless Applications Framework. This framework enables mobile devices like bar code scanners/rfid devices to interact and transct in Oracle Applications. This is a set of applications deisgned speceficially to be used in the warehouse/shopfloor to carry out tasks using mobile devices such as scanning guns in conjunction with Oracle Applications like WMS/Receving/Manufacturing etc. You need to receive goods that you have purchased. When the goods arrive it would be an arduouos task to actually sit and enter all the information with regards to the Item Number/ASN/Quantity etc for each item being received. It would be much easier if you could just scan a barcode and automate the data entry process. And it makes it much faster to enter data. This is precisely the rationale behind all the MSCA applications. Bar codes encode letters and numbers into a concise, simple format (sequences of vertical bars and spaces of variable widths) that machines can read. Bar code scanners read bar codes and conver them into strings that Oracle Applications uses to directly populate fields, the overhead and chance of human data entry is nearly eliminated. What devices are used for the applications and how do they interface with Oracle Applications? All devices used are industrial bar code guns/rfid devices. These can be from a variety of suppliers or makes and need to be certified for use with Oracle Applications. The mobile device needs to have jdk 1.8 installed. This is a special flavour of java called J2ME(Java 2 Micro Edition) which is designed for mobile applications. Each device being used for scanning and interfacing with Oracle Applications need to install the MSCA patch for the relevant release on the mobile device. The user opens the appropriate page/screen that he needs to work on in the mobile application. This could be on an interface on the mobile device itself. For e.g he could open the screen for Item Receive. The user then uses the scanner to scan the barcode which automatically would populate the item number/lot / quantity/price etc. MSCA is a composite of INV/WMS/QA applications which leverage data entry using mobile/rfid/wireless devices. Mobie Device : scans bar codes and passes information onto the MWA server. 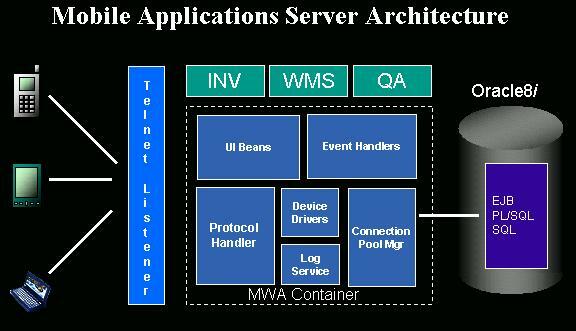 It receives information/data from the MWA server and shows it on the UI on the mobile device. The mobile device is setup to interact with various mwa servers on a given ip address and telnet port. He uses the menu navigation to select a particular action / activity that he wishes to carry out. On the screen the user would then set the focus on a field and scan the barcode to populate the field. MWA Server: Which has protocl/device handlers and J2ME jvm to host the MSCA applications. Has the infrastructure to instantiate the various page/field beans and their respective handlers to manage the user interface and connection pools to render data. It responds to requests from the mobile device by either deciphering barcodes and returning string values in the UI/by responding to other user actions in the application. The data stream indicator is an ASCII character that the MWA server uses to identify the scanning input stream. This is by default set to 28(CTRL+\) and can be changed by modifying the default_key.ini file under $INST_TOP/admin/install. This data stream indicator would need to be pre-fixed(also called preamble) to any data stream/string that the bar code reader reads. This data stream indicator tells the mwa server that this is a scanning stream and is interpretted appropriately to populate fields. Bar Code scanning and customizing bar code scanning/dfi's. Getting the CustomScanManager to work.